defined by chilling twists and turns. One of my favorite, creeptastic series comes to an end and it frankly left me with mixed feelings. There are so many elements that have made this series unforgettable, suspenseful, gripping… Mara’s intrepid, defiant voice still tempered with vulnerability. Unexpected, twisty plot turns that made my pulse race. A love story rife with yearning and impossibility and danger. A question… a million questions… that begged to be answered in this final installment. And answers there definitely were. Lots of them. 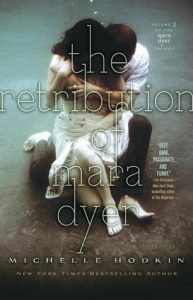 Retribution packs a great deal of explanation and it felt a bit convoluted, particularly in the last quartile of the book. I had some difficulty following the logic even though it had not been long since I had finished the last two books. Explanations ran deep and perhaps traded off character connection in the face of them. At the same time, there were some things introduced in the book that were left unanswered. It made my feelings difficult to process when I’d finished and even now I struggle to articulate my thoughts. Although the book certainly keeps your attention with non-stop gruesome, bone-chilling action, it lacked something and I think it was the aforementioned coupled with a more subtle romance element. Without spoiling the story, I just wanted more of that Noah and Mara charged dynamic that made me cheer and feel for these star-crossed lovers. Now, don’t get me wrong, I think the ending seemed appropriate for the characters, and there were so many great parts to this finale as well… one of them being that somehow, it was even fantastically creepier than before. 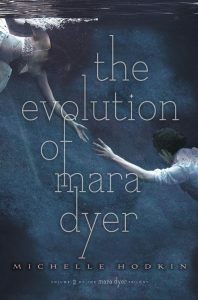 When EoMD concluded, Mara and her friends’ attempted escape from Horizons had gone horribly wrong and now (as revealed in chapter 1), Mara wakes to a reality were her body and her actions are not her own. She is under the control of Dr. Kells. Without knowing the well-being of her friends, including Noah, Mara falls into the depths of her darkness only to be saved from the person she least expects. This first part of the book was so amazing. So haunting. Chilling. Rousing goosebumps to life, inciting my heart to race, my fingers to flip the pages faster. I had no idea what was happening, but the story seemed full of promise and intrigue. 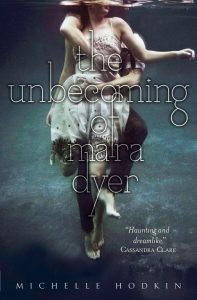 Mara’s demeanor went from scary to scarier and I loved that Hodkin boldly went there with her character. We see past (“before”) and present finally converge, as answers start to peek through the subtext of the story, making connections we never could’ve imagined. Mara’s quest for answers… for a solution… gets bloodier and more gruesome by the day as we inch towards the climatic end. Questioning who she is, who she wants to be, who she’s destined to be, is a big part of this conclusion. Good and evil and the very gray-and-brimming in-between face off, as people take a resolute stand. I’m sad that the series has come to an end and despite the issues I had with the book, I am in awe of Hodkin’s mastery at penning a narrative that is scary, unnerving, surprising and bold. I continued to love supporting characters such as Daniel and Jamie, who sometimes brought some levity and emotional balance to the madness. And I love the complexity that is Mara. Noah. Mara and Noah. What a crazy ride this series has been. I’ll definitely miss it.